The scale industry has changed quite a bit over the past several decades. Years ago scales simply displayed a weight value that was recorded by hand for later analysis. In the past, there was little, if any communication between a scale and any type of computer. As computers have advanced, so have scales and now they can be easily integrated into your business processes. The scale experts at Arlyn Scales have worked hard to continuously improve our scale models to keep pace with the ever-changing technology surrounding computers. One feature that our customers frequently requested was the ability to interface their scales with computers in a variety of different ways. Arlyn Scales listened to this request and implemented a variety of connectivity methods to easily access weight data on any computer that is connected to one of our scales through one of our supported communication methods. In this article we’ll introduce a variety of different ways that you can connect one of our scales to your computer to access weight data. Before we go into the details about the ways that you can communicate with our scales, we thought it would be a good idea to give you a bit of background about our company. We’re not just a fly by night operation that just started manufacturing industrial scales a few years ago. In fact, we’ve been designing and manufacturing scales for more than 30 years. In this time, we’ve honed our craft as it relates to designing and manufacturing high-quality industrial scales. Arlyn Scales is headquartered in Long Island, NY, where we design and manufacture all of our industrial scales. This gives us a competitive advantage over many of our competitors who rely on overseas manufacturing processes to produce their scales. By designing and manufacturing all of our scales in the U.S., we’re able to keep a much tighter control over every facet of the design and manufacturing process. If any problems arise, we’re able to quickly resolve them before our customers are affected. Not only are we able to provide high-quality industrial scales that are manufactured right here in the U.S., but we’re also able to offer our scales at highly competitive prices because of our unique business model. Many of our competitors rely on an intricate team of distributors, which work directly with the scale owners. This distributed business model obviously costs money, which helps to drive up the cost of these scales. At Arlyn Scales, we provide our customers with our scales directly from our factory. This means that the people who are designing and manufacturing your scales are also available after the sale for any issues that may arise. Simply pick up the phone at any time to ask any questions about your scale. We’ll be happy to connect you with one of our scale experts, who likely was involved in the design and manufacturing of your exact weighing instrument. Now that we’ve given you a bit of background about our company, we’ll go over some of the communication methods that allow our scales to stand out among the competition. USB – The most common way to interface peripherals to computers is with a USB, or Universal Serial Bus connection. Our scales offer full USB support, which allows users to connect a scale to their PC using a simple USB cable. After connecting a computer to our scale via a USB cable, scale owners can control their scale using our USB Remote Software. 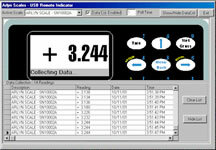 This software not only allows users to access weight data, but also to control and monitor their scale from a connected computer. Once connected via a USB cable, users can easily export weight data that can be viewed and manipulated in popular computer programs such as MS Excel or Access. Wi-Fi & Ethernet – One of the newest communication options we’re offering to our customers is our Ethernet and Wi-Fi interfaces. If your scale is located close to an Ethernet connection, simply run an Ethernet cable between your scale and Ethernet network. If your scale is not located close to an Ethernet connection, but you have an active Wireless network, our scales can simply connect to your network wirelessly. Whichever connection method you choose you’ll be able to easily control your scale and access weigh data from a computer that is located within your facility, or thanks to the beauty of the Internet, one that is located all the way around the world. At Arlyn Scales, we offer our Remote Indicator Software, which allows our customers to easily control their scales remotely, provided that their scale is connected to the Internet. Datalogging – While many of our customers are able to connect their scale to a computer via one of the options listed above, some simply are not. Some of our customers have to place their scales in areas that are not conducive to a network connection, or a computer of any kind. In these instances, we still wanted to allow our customers to have easy access to their weight data, which is why we offer datalogging support. Datalogging allows our users to simply plug in a USB drive directly to the scale’s USB port, where weight data can be easily downloaded for future use. This data is saved onto a USB drive in a CSV format, which is easily accessible by popular computer programs such as Microsoft Excel and Access. Have Other Questions About Interfacing to Our Scales? If you still have questions about the communications methods listed above, or any other scale feature, feel free to reach out to our team today by phone at 800-645-4301, or through our contact form located on our web site.